I was super lucky to start my 2013 fishing season in April in the Florida Keys throwing flies at tarpon…..and even luckier to hook and land several. Awesome!! I came into the 2013 striped bass season very concerned about the status of the stocks based on the downward trends in the data and my own personal experience on the water over the past few years. I wondered like many if the 2011 year class was going to show up strong or not, and what about the bigger fish…..were they going to be around. Well, it was basically no and no. In general my fears were born out. If you read on, you will see there were some periods of good fishing, but overall it was another down year from start to finish, from Cape Cod to Maine to Martha’s Vineyard. But as always I learned a ton, saw some great new water and had a ton of fun fishing and guiding. I caught my first bass of the season on Cape Cod – Falmouth to be precise. We were wade fishing the pond openings in the mornings and the ebbing tide was full of micro bass from 10-18 inches. After a cool, wet spring, I wasn’t sure what to expect. I had fished a bunch of times in my home waters around Plum Island during the first week of May and come up empty, so wasn’t sure what we would find on the Cape. I was happy to find fish in the pond openings and we also had great fishing on the cinder worm “hatch” inside the ponds, where we canoe around tossing small flies with floating lines in late afternoons until dark. However, we also ran the Elizabeth Islands, hitting the shorelines and holes hard and didn’t have much luck. So I came away pleased to see the volume of small to medium fish in and around the ponds but discouraged by the lack of fish around the islands. Back home in Newbury, the third week of May started to produce some outstanding fishing in the estuaries and rivers. I was focused on the Parker River and Plum Island Sound and we crushed surface feeding schools of bass up to 36-38″ for 4-5 days. Unfortunately these schools broke up and the fish did not hang around as long they had in past years. By late May you had to work harder and move further to find fish. I fished the Merrimack River hard around Memorial Day weekend and it was solid but not great. The herring run, both river and sea, was slow, so the hoped for surface feeds in the river mouth never really happened. But we still found good fish inside and outside the river, they just weren’t showing much. My favorite month to fish for striped bass – hands down. You have the entire season in front of you and a history that tells you that is SHOULD be really good. This year on the Merrimack River it was so-so at best. There were some OK outings, mostly out near the river mouth and outside along the beaches. But never great volumes of fish. That was the disappointing thing to see. We had good fishing the first week of June on Joppa Flats and across on the Salisbury flats, but I kept thinking that the usual schools of big bass would push up onto Joppa Flats the next day…the next day…but they didn’t. Ever really. All month. I am not out there every day and I know some friends of mine who found fish up on the flats, but I looked hard when I could and I saw fewer than any year I can remembers in the past 25+. Flat out f—ing bummer and worrisome. I also had a chance to guide for a day in Boston Harbor in early June, a charity event for Thompson Island Outward Bound. That was really cool because we found some big bass feeding on mackerel off Winthrop and we all caught a lot of good fish. A very impressive fishery. I also spent 4 days fishing around the Elizabeth Island and Martha’s Vineyard. Again we saw some pockets of good bass fishing but overall it was below par. So overall, June provided some good moments every where I tried, but I caught fewer fish than past years and never got a bass over 40″. Not good! July is an interesting month for striped bass fisherman as fish can be found in a wide variety of places. I always spend more time in the open ocean looking along the beaches or further offshore. I also have a chance to fish in southern Maine starting in July. Overall July was pretty good. Maine was productive with breaking 20-30″ fish close to shore and bigger fish cruising offshore. MA was about the same as we had some decent breaking fish along the beaches and near the mouth of the Merrimack River and some cruisers offshore on calm days. I had one good encounter with some 10+ pound bluefish and was excited….but that was all for bluefish in July except for the occasional small blue near the Merrimack River mouth. I looked for fish along the beach to sight fish but never saw many. August was slow overall in the Plum Island area but mid-month a push of big bass showed up here and there on the beaches and stayed through early September. These fish were often found in shallow water and were tough to catch on fly but crab flies worked at times for me. Bait fishermen absolutely crushed these fish – especially off the front side of Crane Beach when they reopened the commercial season for a few Sundays. I fished very little around Plum Island because I spent almost all my time on the water south of Cape Cod, fishing around the Martha’s Vineyard and the Elizabeth Islands. Caught a few bonito, a bunch of albies and a ton of bass (but all under 32″). The bait down there was bay anchovies, which were in great abundance, leading to awesome surface feeds of many species. But when fish key on on bay anchovies they can be very difficult to hook with flt or spin, and that was frequently the case, especially with the albies. Locally, the bass fishing really tailed off as September wore on and October was very slow. 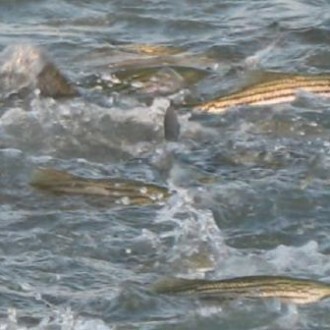 In the final analysis, 2013 will be remembered by me as another year witnessing a declining striped bass stock. Very discouraging that interstate fisheries managers are not making the hard decisions to conserve this resource. I am worried about the next 3-5 years. There will still be some very good bass fishing but overall I am afraid of a continuing decline.